Sols 2172-74, September 17, 2018, update by MSL scientist Vivian Sun: Last night we learned that our drill attempt on “Inverness” was not successful, reaching only 4 mm into the rock. Today’s tactical team bounced back from this news and quickly assembled a plan to move on. This proved to be a busy day for the whole team, including me as the Geology Keeper of the Plan! 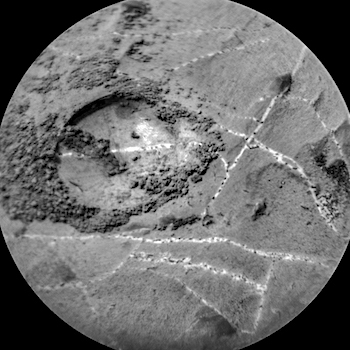 This entry was posted in Reports and tagged Aeolis Mons, Clune, Curiosity, Gale Crater, Inverness, Lake Orcadie, Mars Science Laboratory, Mount Sharp, MSL, Murray Formation, NASA, Rockend, Stoneyburn, Vera Rubin Ridge. Bookmark the permalink.